Located just 22 miles (35km) from Olympia, sleepy little Katakolon isn't much to look at at first glance. However, its proximity to Olympia and its deep-water port make it an ideal cruise destination for large cruise ships in the Ionian Sea. 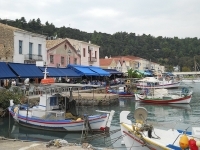 Katakolon itself is formed by three parallel streets: the first is a seaside pedestrian thoroughfare with a few restaurants and tavernas; the second has mostly shops; and the third is more residential. As a general rule, the further you get from the docks the less touristy the feel. There isn't much to do in Katakolon other than browsing the tourist shops and whiling away an hour or two in the pretty seaside tavernas; nearly all cruise passengers opt to take a tour to the famous archaeological sites at Olympia. You can easily walk around Katakolon. To get to Olympia there are plenty of taxis available, but it's better to take an organised tour so you don't miss the most interesting information along the way. There is also a train but timetables are notoriously unreliable. The best beach in Katakolon, Agios Andreas, is a short taxi ride away, and there are regular buses in the summer. While there are a few beaches, shops and restaurants in Katakolon, the main attraction is the ancient city of Olympia, where the Olympic Games originated in 776 BC. The remains of numerous temples, gymnasiums, stadiums and changing rooms are still visible, and there are two archaeological museums nearby. The Sanctuary of Olympia is still where the Olympic Torch is lit by sunlight for each modern games. Guided tours of Olympia take cruise passengers through one of the prettiest areas in Greece along the way. There are a few tourist shops along the promenade in Katakolon, but more interesting souvenirs can be found in the art galleries on the main street, including beautiful bronze sculptures.